A few weeks ago, Partos – the Dutch association of NGOs working in International Development – hosted an IATI introduction meeting for Dutch NGOs. I was asked to present how IATI data can be used. A great opportunity to finally collect some examples I’ve seen on different occasions in the past few months. This is the most common use of IATI data I’ve seen so far. 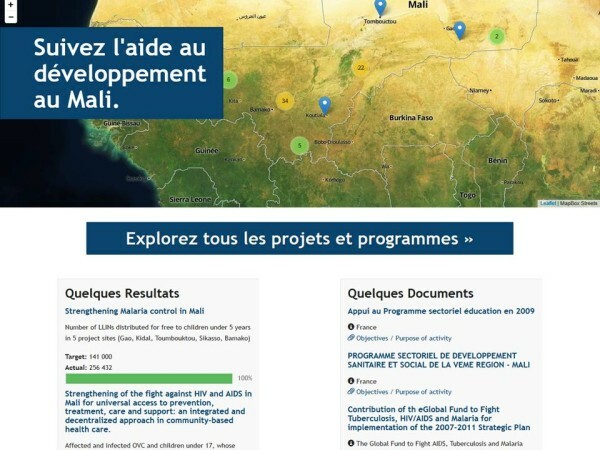 Examples include openaidsearch.org, the Mali Aid portal that Publish What You Fund created and the Open UN-Habitat portal just to name a few. 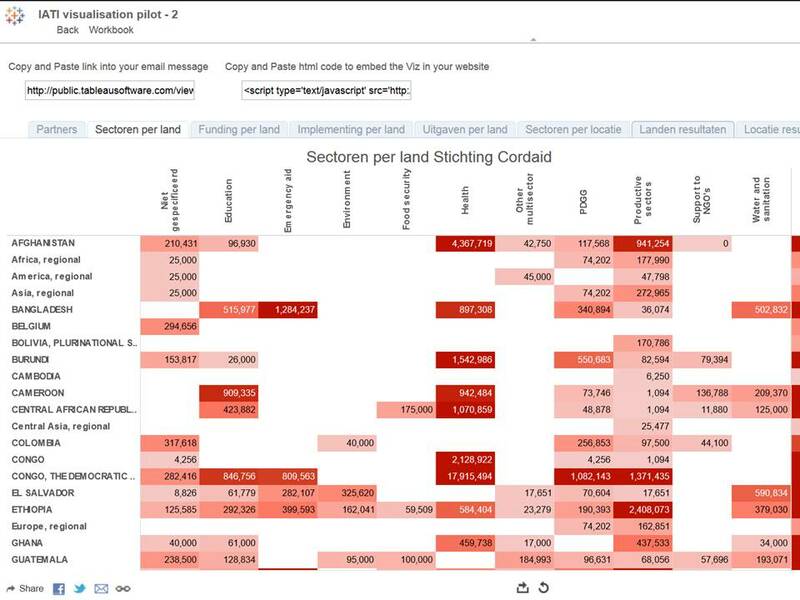 The Cordaid example shows that an NGOs IATI data can be a great source for the project section on their website. And rather than having to update the information manually, it is automatically updated whenever the IATI dataset is refreshed. To achieve this, Cordaid makes use of AkvoRSR to process the dataset and make it available via an API, which is then read by their website. 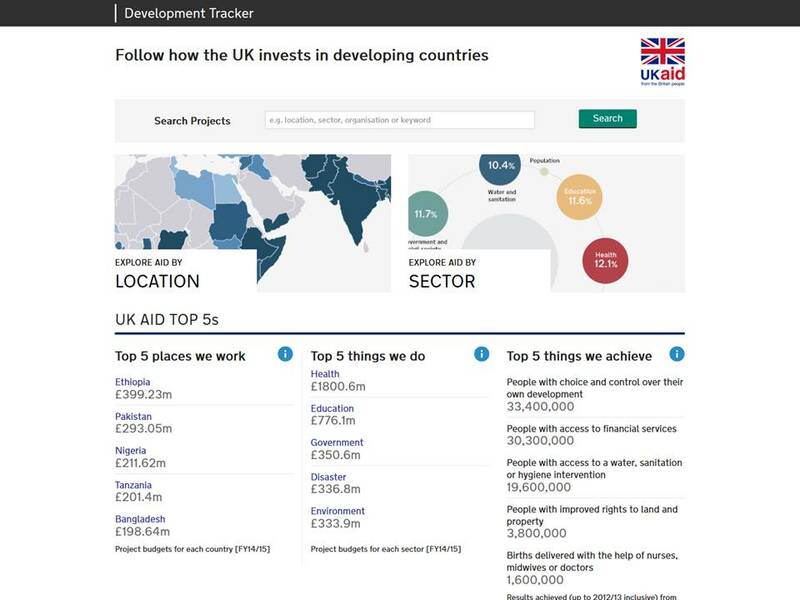 Perhaps the best example of this kind of use is the UK’s DFID development tracker. Journalists haven’t discovered IATI as a data source yet. This article from one of the leading Dutch newspapers states that “the Dutch have silently left Uruzgan”. 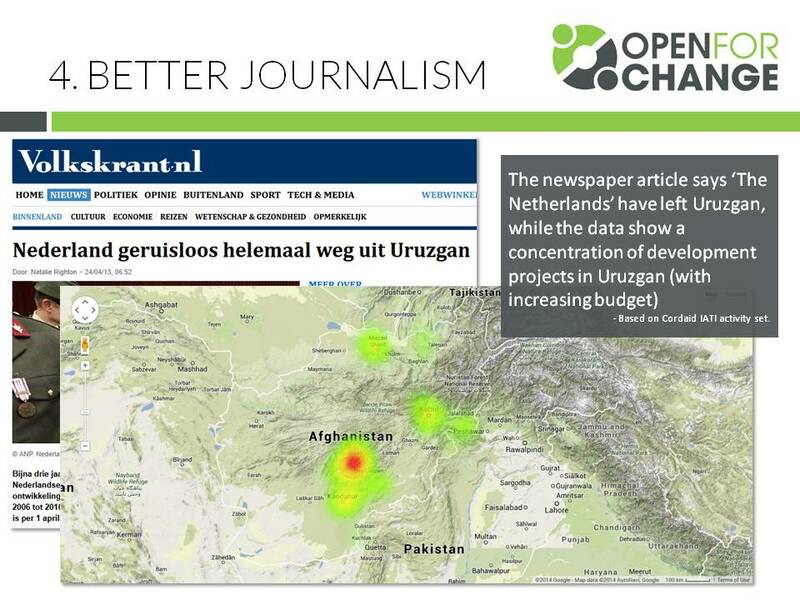 One look at (only) the Cordaid dataset shows that Uruzgan is one of the ‘hotspots’ for development projects in Afghanistan. And that is only one Dutch NGO! I think – I sincerely hope – that the release of more IATI data will bring us more nuanced stories about the state of international development and bring more reality in the debates about ‘aid’. The Dutch Ministry of Foreign Affairs has been experimenting with building dashboards on IATI open data. Using Tableau Public, MySql and Pentaho Kettle they have made their own visualisation of Cordaid IATI data. They chose to use the Cordaid data set because it is rich and contains results. 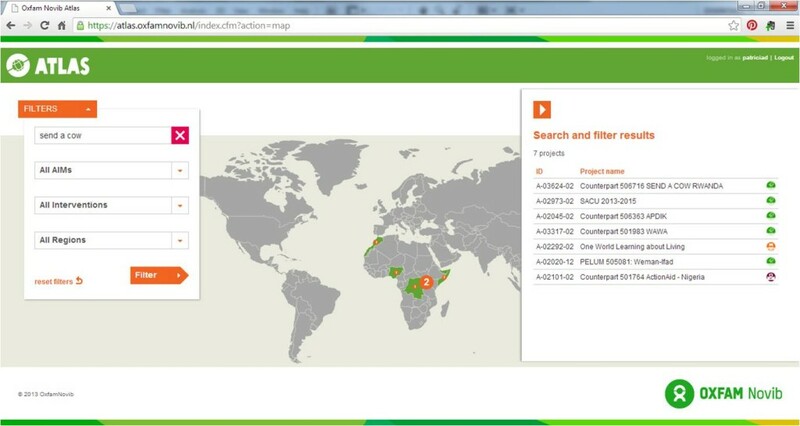 Oxfam Novib is working on an internal project browser that should soon give their staff in offices around the world a better insight into what their organisation is doing in each country. Since it is fed with IATI data, it should be easy to also add the IATI data published by Oxfam GB. 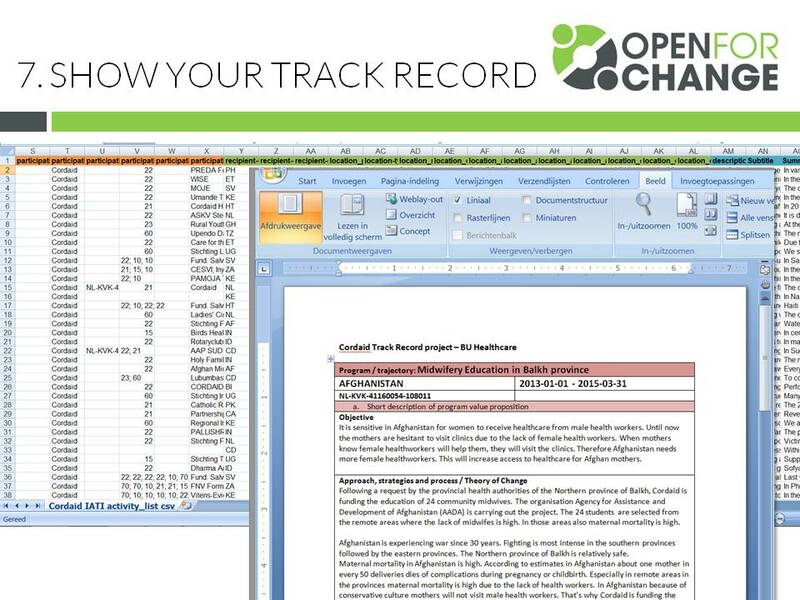 Thus, IATI becomes a format to combine information of different Oxfam organisations across the network. 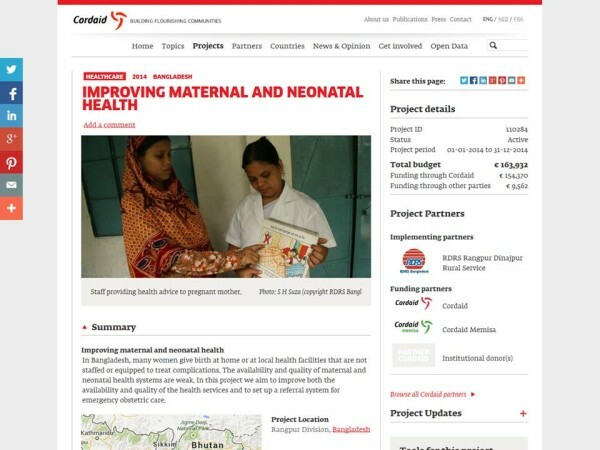 Working with Cordaid, this is one of the unexpected gems: most NGOs regularly have to provide a track record of previous (or current) projects on a certain subject, or in a certain area. This is often a painstaking effort, looking for the right person to give you the details on the projects you want to include in the track record document. 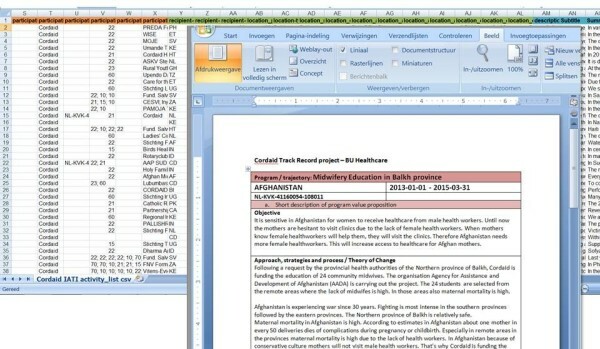 With the IATI activity file loaded in Excel, and a simple ‘mail merge’ in Word, you can easily produce a track record document filtered on country, theme, period, budget, … Of course it helps if your IATI dataset contains proper descriptions and sufficient other fields. You can find a few more examples in the presentation below. If you think I’ve missed a great example, please drop me a line or leave a comment. 5 Responses to "7 ways to use IATI data"
Thanks Bill, that’s indeed a different perspective that was missing! Thanks Rachel, looks interesting! Do you know if there are any grant portfolios online yet? Would love to see how this works.